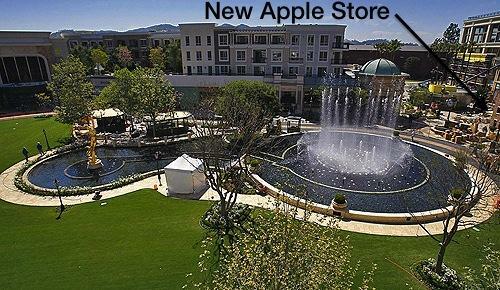 Tomorrow's grand opening at the new location will create the two closest Apple Stores, but deliver a welcomed relief to the regularly packed Glendale, California store at the Galleria, which was the company's second outpost to open in 2001, according to ifoAppleStore. There are 19 other Apple Stores in the greater Los Angeles area, including a Pasadena store just 7 miles away from the twin Glendale locations. Los Angeles itself boasts three other stores within about three miles, stretching from Century City to stores in Beverly Center and the Grove. The new Americana store, which opens tomorrow at 10 am, will be Apple's 239th US store and the 332nd location to open internationally. At 14,000 square feet, the store will be among the company's largest. Most stores range from 3,000 to 6,000 square feet, with the largest being 20,000. Apple has consistently planned to open stores where it has the most customers and most potential for growth, not simply picking arbitrary locations across the map to cover territory. This has resulted in heavy concentrations of stores in urban areas with significant tourism, with Las Vegas, New York City, Honolulu and San Francisco each having three stores within their boundaries. The very appearance of an Apple retail store creates traffic and demand that has historically generated a need for addition stores within the same area. Apple is therefore planning a fourth store in Manhattan located within Grand Central Terminal, and has closely located stores in the proximity of Silicon Valley, where Palo Alto and Stanford currently claim the title for closest stores, being located just 3,738 feet apart. When Apple's chief executive Steve Jobs approached the Cupertino, California city council about building his new vision for a futuristic corporate headquarters there, he rebuffed attempts to cajole his company into opening a retail store within the town as well. The company's new headquarters would be located less than five miles away from the existing Valley Fair Apple Store in Santa Clara, less than ten miles away from the Los Gatos store to the south, about 11 miles west of the Oakridge store in San Jose, and about 15 miles east of the two stores located in Palo Alto.